I had overheard that they were hunting crocodiles on the Belize border. I don’t know where or when the information had passed my ears, but I knew it, and it swam through my brain, occasionally surfacing in my thoughts. Just imagine. Hunting dinosaurs. One day it became too much. I spoke to my editor. Mexico’s border with Central America’s only English-speaking country is made up of one large town, Chetumal, a series of small indigenous settlements, and bush. Thick jungle, home to rare and exotic fauna. Spider monkeys, creatures both maleficent and graceful, with the leathery tips of their muscular tails serving as their fifth limb. Macaws, brightly coloured parrots whose scream carries long distances across the black jungle night. Jaguars, solitary and ruthless. Even black panther, jaguars born entirely black, rejected by their mothers and forced to fend for themselves from day one. Panthers are the deadliest of all cats. Driving through the region it’s clear how the bush envelops everything. The highways are tunnels sawn through the dense growth, which, ten metres high, make up impenetrable walls. Standing on the tarmac, facing the dense jungle, it’s impossible to see more than ten metres into this other world, the fringes of civilisation. God knows what can see me. Chetumal is perched between the bush and the Caribbean. Standing at its easternmost point you can see Belize across the wide strait to the south. Tall palms sway in the wide central square. A muggy, humid town, its people are equally relaxed, a strange dynamic for a state capital. Four hours up the coast sits Cancun, a wholly more active place, but this town has existed since colonial times. An important Spanish settlement keep the warring English, French and Dutch at bay as they battled over the Caribbean. “We’re looking for crocodiles,” we told the tourist office. Blank stares and heavy breathing was the response. They had just returned from lunch. Outside the office an inquisitive chap had overheard our conversation. Whether the slaughterhouse had been built beside the pond, or whether the by-product of its work had created it, it was impossible to say. A water-body of fifty square metres, its was bright red. Blood-red. As we stood looking at it, the drainpipe leading from the building gurgled, and promptly issued a short burst of blood, the excess waste from a pig that had squealed its last within. Its entrails shortly followed. This created a mad rush in the pond, as twenty of what had appeared to be floating logs made a rapid dash for the meat. 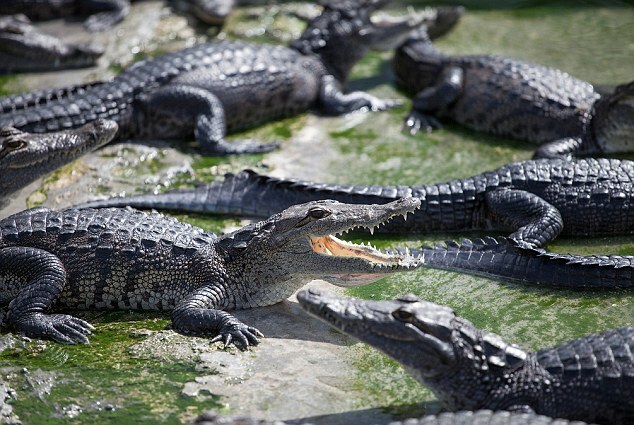 In a frenzy of activity, the crocodiles grabbed at the largest piece they could and quickly swam off to a quieter corner of the pond, where their enormous jaws were raised out of the water, allowing the food to slip down, unchewed, into their bellies. The mosquitos quickly chased us out. With pictures safely taken, I knocked on the doors of a nearby hut, where a young mother, seventeen years old, was nursing a six-month old baby. Her older son lay sprawled on the bed in the sweatbox. “The crocodiles get enough to eat, and they leave us alone,” she said, wiping the sweat from her youngest’s forehead, revealing a series of red insect bites. I understood that I shouldn’t be here when he arrived, and thanked the girl. A nearby woman, immensely overweight, welcomed us into her house. Walking through to her back garden she showed us where the chicken coop had been relocated, now behind their gated wooden fence. “They don’t think much of chicken wire, and you can’t fight them off at night,” she laughed, pointing to the red water fifty metres away. We found out the explanation the next day.